My early start has me in front of traffic, and I'm moving fast. Although I recognize many landmarks, somehow I miss the turnoff for the Barr Elias shortcut. How is that possible?! Oh well… since I've liked what I've seen of Lebanon so far, I might as well ride a different route back to the Damascus freeway. This road happens to be in better condition than the other route, and I enjoy the ride. At 9 am I'm at the Damascus-Beirut artery. It doesn't make sense that it's taken 3 hours to ride what my map says is only 40 k. I start west, and at 9:15, pass the turnoff that the driver dropped me off at two days ago. Hmmm - the same guys I saw two days ago are still there, in the exact same place! I wave, and they wave back. The hotel manager back in Baalbek had suggested that the only real climb I would have to deal with was the zone between the two borders. He suggested that I could simply offer a couple of bucks to one of the pickups that cruises the strip between the control points, and I'm fine with that. But the climb isn't that bad. I do grab the back of one of the slow eighteen-wheelers for a few minutes, but I get bored and let go. At 10:45 am I arrive at Syrian customs, and the Dunkin' Donuts that I spotted the other day. There are a few nice shops here, and the café turns out to be a great deal: 1,800 LP ($1.20) for a cheese omelet with a side of cut tomatoes and cucumbers plus a side of flat bread. He server speaks some English, so I ask him to write, in Arabic, the names of some of my upcoming destinations, specifically Qatana, where the hotel is supposed to be, and Al Kisweh, where the campground is supposed to be. 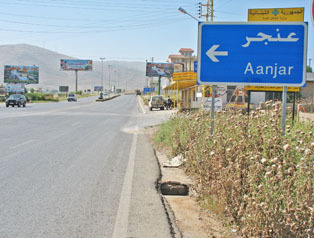 Feeling good, I splurge on a 3,000 LP ($2) medium Dunkin' Donuts coffee, then roll 30 meters to Syrian passport control. Syrian Customs is quicker than the first time and soon I'm moving. The downhills are nice and not dangerous. I stop and study the hell out of my maps, but I'm playing it safe and planning to ask locals well before where I expect the turnoff to be. At a gas station, a man with excellent English indicates that there is no hotel in Qatana and that the back roads I'm planning to take will be difficult without speaking Arabic. He suggests I sleep in Damascus. 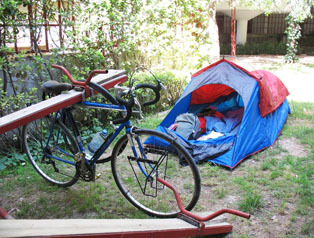 I don't want to go back into Damascus just to sleep and I decide that if both the hotel and camping options fail. I'll push south toward Der'a, and then flag down a ride if necessary. I find the Qatana turnoff easy enough, but then things break down. I'm almost immediately at a 4-way intersection. I've just passed a Qatana sign indicating straight, so I guess that I go straight through this intersection. A taxi driver stops, calls me over and indicates that I take a left. I take the left and bicycle a few hundred meters, then u-turn back to the intersection, where I go what would have been straight. It's a nice ride, but it's hard to relax. Every person I see, I point in the direction I'm headed and ask, "Qatana?" I pass through a very wealthy community, complete with racehorses grazing in well-maintained meadows, then find myself in hilly scrub desert. I've run low on liquids a while ago, but I see no stores. Eventually I drop out of the hills, enjoying a smooth ride into a Qatana. There I get water and a soda, and learn that there is no hotel. No one believes that there's camping at Al Kisweh either. I'm frustrated. One man speaks up and says that there is a hotel in Sahnaya, which on my map appears to be even closer than the camp ground would have been. I get directions: 4 kilometers, take a left at a traffic circle, then go 4 kilometers, then take a right, and then go 2 kilometers. I cover the ground pretty quickly. I'm in a suburban area, so there are plenty of chances to make a wrong turn, but the directions were pretty clear, and I'm using my watch's minute hand plus my 15k/hour historical pace to estimate when to turn. Wow - here at what I think is the right I'm supposed to take, is a billboard reading Four Seasons Club. I take a right at a sign that also says Two kilometers later I'm at the Four Seasons: a pool/tennis resort. The front desk tells me that there's no room. Aaarrrggghhh! It's about 3:30 in the afternoon; this ride started at 6 in the morning, and I'm beat! The manager invites me to sit down and have a drink, but I explain that I must keep moving since I'm not willing to go north into Damascus. I may have asked about the camping possibilities at Al Kisweh, because he says that he doesn't think it exists, but then offers me camping on his property, if I have what I need. "No charge," he adds. I'm thrilled, say, "Yes" and add that payment is not a problem. A few minutes later I'm led around the side of the building to the children's playground. "OK?" I'm asked. "Perfect!" I reply. I set up the tent, learning what, that's what those extra four stakes that I didn't bring were for. I change to my nice clothes to re-present myself. My stickiness hasn't been addressed, however and I need to take on that issue one way or another: towel-bathe somewhere, or sneak into the pool after closing, or something. I take a walk around and re-visit the front desk. I gesture that I'm looking around and ask about a restaurant. One of the gals gestures "Swimming?" and I express interest. She escorts me outside and points up the stairwell. I go up there, but the gate is locked. Do I need a room key? I return, gesture the problem, and she leads me outside and points to the other side. As I head up over there, my original contact, the guy at the car entrance, takes over and starts showing me around. Something transpires about me going upstairs to the outdoors pool and restaurant, and instead I'm shown the all-male inside pool. It's a bit dingy in here, but they are serving ice-cold beer here, at poolside, so this works for me! 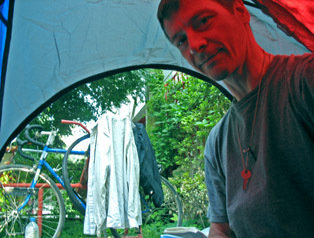 I return to the tent, create a daypack with shampoo, diary, etc. and return to the inside pool. This time I go through the regular entrance, paying the posted rate of $300 SP ($6), plus 50 SP ($1) for towel rental. No problem for me, but pretty expensive for a country where the per capita income is only $1200 a year. I restroom, shower and even swim - well worth the $7 to wash this long day off. I'm sound asleep before 10pm. Someone's waking me up. Something's the matter! No - It's just the hotel manager. He wants my passport, to register me. I follow him, do some paperwork, then return to the tent. Not sure why this had to happen at 11:30pm. I fall back into a deep sleep. 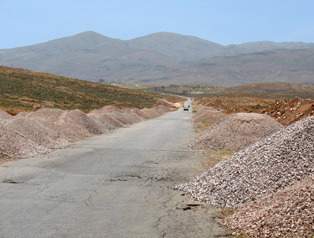 Lebanon had the greatest road-surface hazards. On this stretch of road, someone seems to have swiped the drain covers. 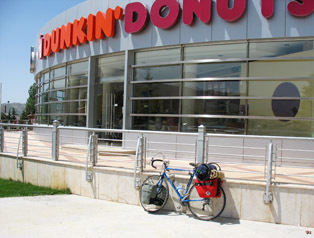 At the border between Syria and Lebanon: a Dunkin' Donuts! My "shortcut" around Damascus really was seeming a bit dicey.. Finally my tent earns its keep - in the hotel playground! 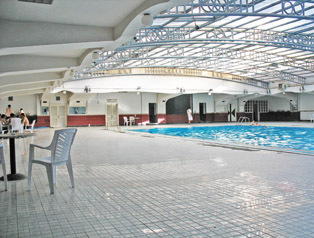 The Four Seasons Club's indoor pool. Settling down for the evening.